Content Machine outlines a strategy for using content marketing to build a 7 figure business with zero advertising. By teaching the fundamentals of content marketing, how to create great content and how to stand out from the crowd, it simplifies the otherwise challenging process of creating content with impact. Since the purpose of content marketing is to build a great business, Content Machine focuses heavily on how to create a high growth business off the back of your content. Author Dan Norris shares his story about how he grew his WordPress support business from scratch to over $1m AUD annual run rate in 2 years, spending only $181.23 on advertising. The lessons learned form a framework for building businesses and scaling content marketing, that are documented throughout Content Machine in terms any entrepreneur can understand. The book outlines the #1 biggest mistake that kills content marketing efforts and how the best content marketers in the world have built their audience, their content and their business. It provides downloads and frameworks to help the reader with every aspect of content marketing, from idea generation, to writing guidelines, to hiring and scaling a content team. Whether you are a blogger, content marketer, entrepreneur or marketing manager, Content Machine will help you see the return you deserve from your content marketing efforts. Dan Norris is a 4-time Amazon best-selling business book Author. His first book The 7 Day Startup went to #1 in the Startups category on Amazon, sold 30,000+ copies and inspired thousands of entrepreneurs around the world to launch their companies. It rates 4.7 on average from over 340 reviews and is regularly listed in top business book lists. 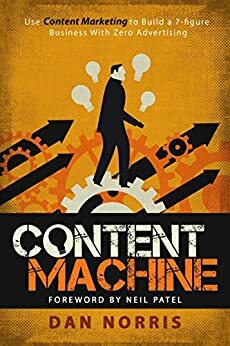 His second book Content Machine ranked at #1 in the web marketing category and went onto sell 15,000+ copies rating 4.8 out of 122 reviews. Dan's dry humour, ruthless honesty and genuine storytelling make his books interesting and fun but the focus is always on being actionable. With Operation Brewery and Create or Hate coming out in 2016 Dan became a 4-time Amazon best-selling author. His books have been translated into 9 languages and used in business courses at university level around the world. Content Machine is the book that the small business world has been waiting for. There are so many times when frustrated business owners say to me "I just don't get it." Well, now I can hand them a copy of Dan's book. I think that this book is an excellent resource for the small business content marketer. I particularly liked what Dan said about doing better than your competition. This has certainly been true for me and for the clients I work with. If you are looking for a book that explains how content marketing can help grow your business, this book is a terrific place to start. 5.0 out of 5 starsAnother great read from Dan! I really enjoyed this book - I devoured this and the 7 Day Start Up while on a cruise and learnt so much from both of them. I love Dan’s style of writing and delivering info in bite sized chunks. It’s very helpful for someone who often has a short attention span! Dan has a really down to earth and clear way of communicating. His explanations and directions make so much sense. I have been reading a lot about content marketing and this is by far the best that is available. Big fan of Dan Norris and this book didn't disappoint. Lots of actionable advice and it's a nice book I can pick up again later for a refresher to help with my own content projects. 5.0 out of 5 starsFull of valuable resources and years of experimentation of what works. It's be great to watch Dan grow his business over the past few years and the valuable knowledge he dishes out, mostly for free. I found this book to be a captive read and full of resources to go action and do something. Thanks Dan, you have inspired me to get off my lazy... and get moving. Dan Norris has written the perfect primer for Content Marketing. I will be using Content Machine as an important resource in my teaching of Digital Marketing. Succinct, personable and practical! 5.0 out of 5 starsThis guy speaks my language! I have read many entrepreneurial books, but none have resonated with me like this book. Great content and free guides to help you along the way. Thankyou! Solid strategies and some great nuggets, as well as some inside industry experience of how content marketing can increase your client base. Worthwhile and easy read.